After my recent article on music, “Breaking Bad, Why Misalette Music is Destroying the Faith”, a number of readers who are choir directors contacted me asking for practical help on introducing chant to parishes that currently use praise and worship music. For those people, I pass on a detailed account of the experiences of one choir director at a small church in rural Georgia, Our Lady of the Mountains. He describes how he and the pastor had worked together to win over the parish. This is not intended as a formula that will be right for every parish, but I hope some will see how the principles he is using might be applied in their own situation. The title of this post comes from a phrase in a section at the end of this choir director’s piece. It is perhaps a little melodramatic in choice of language, but the point is well made. He makes it plain that however sensitively and diplomatically the director handles the changes he makes, he is never going to convince everyone. Liturgical music is an emotional subject for many, and some people are likely to object; some of those will do so forcefully, and do all they can to undermine the changes. So while we ought to do all we can to win people over, he says, we must accept that some won’t be, and not be deterred by that fact. Nonetheless, I should point out that the tone of the article is generally optimistic! I suspect that there is no single formula for this task of changing management, and finding the right approach will depend on many variables. What is done will depend on how great the divide between the current situation and the ideal; on whether you have the support of your priest, and that of your bishop when complaints are made, and so on. Also, the approach will be different depending on whether or not we are talking about the EF or the OF, the additional flexibility of which can be helpful. Therefore, I encourage people to post their own experiences of doing this successfully in the comments below, for others to read. I present one additional point of my own based upon my own experience. I suggested to one choir director who told me that his priest was not interested in seeing any changes in the Mass, that he might find a group that would commit to singing Lauds or Vespers in the church every week on Sunday. Although one would hope that the priest would want to be involved, he doesn’t have to be, and if one doesn’t demand his presence, he is less likely to object. The point I am making here is that if you find that you have to change things gradually (which will be unavoidable in some situations), see if you can establish also some aspect of the liturgy in which you have full control, and the ideal is presented in its fullest form. Then it is there for people to see right at the start, and this will inspire them to be involved in the main project. Again, I would welcome readers’ thoughts on this. So here is the article; it can also be found online at the church’s website. When the pastor of Our Lady of the Mountains, Fr. Charles Byrd, first called me, he had a vision, and he needed my experience and training to help make that vision a reality. He didn’t have much to offer in the way of compensation, but what he did offer was his complete support and trust. I in turn was motivated by his love for the Church and Her Divine Worship. He sought to be obedient in word and deed, and he knew that sacred music was a part of that obedience. His attention to the details of our worship was enough to make me want to be part of the village, but I trusted him to be the chief. Step One: A spirit of trust and cooperation between pastor and music director. It’s got to flow both ways. The resources that Fr. Byrd had inherited when he came to Our Lady of the Mountains were dismal. The Third Edition of the Roman Missal gave us the opportunity we needed to cast aside some of the less-than-adequate books that were in the pews and look at some of the new hymnals and missals that were being published. A committee was formed to evaluate several hymnals based on a set of standards drawn up from a compilation of the various church documents pertaining to sacred music. Did the hymnal contain at least some of the Latin chant settings for Mass? Did it contain a chant-like or polyphonic English Mass setting? Were the hymns noble in form and in conformity with Catholic doctrine in text? Were the chants from Jubilate Deo included in the hymnal? 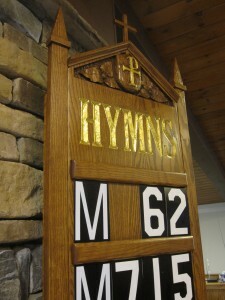 Since we couldn’t afford to replace the hymnals and the missalette at the same time, we chose a hymnal first. The St. Michael Hymnal offered us a bit of a carrot in that Richard Rice’s simple Entrance Antiphons were included, and we saw this as a first step in moving away from the hymn-dominated liturgies to which the congregation was accustomed. For the choir, we purchased The Choral Gradual, also by Richard Rice. These SATB settings of the Psalms are a perfect introduction to singing the propers, and since the choir members were accustomed to singing hymns in four parts, this was a good way of transitioning from melody-driven music to more chant-like antiphon and verse music. The Chabanel Psalms by Jeff Ostrowski made it possible for us to have a dignified Responsorial Psalm in place each week. Step 2: Choose a permanent (non-disposable) hymnal and other resources that uphold the Church’s vision for renewal of the sacred liturgy as prescribed in the documents of the Second Vatican Council and that draw abundantly upon the Church’s treasury of chant. With our new hymnal in place, we could begin introducing the concept of an Entrance Antiphon. Like most parishes in the United States, the congregation knew little to nothing about such things as propers. We had to start small, so the first few weeks all we did was sing the antiphon through twice — choir or cantor first and then the congregation, following then with a hymn. Over time, we added verses along with the antiphon, with the people singing after each verse. Eventually, the “opening hymn” was replaced with the proper texts of the Mass and the congregation was singing the antiphon heartily. Concurrent to this, we were using the hymnal to learn a new English Mass setting for Ordinary Time and a Latin Mass setting for Advent and Lent. Eventually, we learned yet another Latin setting, Missa de Angelis, for Eastertide and Christmastide. Fr. Byrd was instrumental in teaching the Latin Mass settings because he would sing them not only for Sunday Masses, but at the Masses he offered daily. Those daily Mass attendees learn the chants quickly and are very helpful when it comes to singing in the larger Sunday congregations. Chanting the dialogue prayers was also seen as an essential element and crucial to the overall vision. The pastor placed great emphasis on learning these chants as the General Instruction directs that these should take primacy in singing the Mass. Step 3: Start small. We didn’t have all the resources that we needed at once, but we worked with what we had. Stay simple, but keep it noble. Introduce new things gradually. Step 4: This is crucial: Start growing a children’s choir! Children take naturally to chant. They have no hang-ups about Latin. They do everything with enthusiasm and pure joy, and it is contagious. Purchase enough of the Liber Cantualis for each singer to have one. They are small and fit small hands perfectly. Children love singing from them! Teach solfege. Teach neumes. Teach easy polyphony. Teach proper vocal technique. Identify gifted young singers early and begin training them. The children in turn will become advocates for your sacred music program (part of the village), not to mention your future adult choir members. With forward-looking folks on the Parish Finance Council (it helps to make a member of the choir the Finance Chairperson! ), it took about a year to have the money in place to order permanent pew missals. We didn’t form a committee for selecting our pew missals, but Fr. Byrd and I did have a standard by which we would evaluate our options. At the time we were looking, the only viable option based on our standards was Adam Bartlett’s Lumen Christi Missal. Other fine missals were in the works, it seems, but the Lumen Christi Missal was already available and it had everything that we were looking for: the Lectionary Readings and Antiphons for Sundays and major Feasts and music for chanting the Proper of the Mass in the vernacular. Remember, we were starting from scratch, so our choir members were also learning about sacred music along with the rest of the congregation. Most of the choir at the time consisted of untrained singers who gave generously of their time, but were nowhere near ready to sing the chants from the Graduale Romanum. We needed exactly what the Lumen Christi Missal offered: simple but dignified modal chant settings of the antiphons in English with organ accompaniment if needed. We knew that our choir and cantors would eventually progress to the point of singing from the G.R., so it was good that the Lumen Christi Missal provided the Latin text of the proper alongside its English translation for the congregation. No one will be able to complain that they don’t know what the choir is singing because they can’t understand Latin. Step 5: Make the Finance Council part of your village. It doesn’t hurt to have a member of the choir (or two) on the Finance Council, the Pastoral Council, the Knights of Columbus…you get the point. Step 6: Purchase a permanent pew missal that comes complete with music resources for your cantors, choirs, and organist. And speaking of organists, Step 7 is, Get an organ and hire an organist (or make one, as we did – more about that in a minute). The only instrument in the church when Fr. Byrd arrived was an electronic piano. There was no money in the budget to purchase an organ, but about a year into our work of singing the Mass, an anonymous donor came forward with the money. They had been moved by the efforts of our village and convinced by the effect that sacred music was having on our parish. Read that again: convinced by the effect of sacred music. A transformation was occurring among the choir members and the congregation. A deeper spirituality was blossoming in the hearts and minds of those called to worship. The gift of the organ was a result of this new reality, but where does one find an organist willing to drive to this out-of-the-way place to work with a nascent sacred music program? As it would happen, the pianist we had hired to play the little Kawai was about to become an organist. Again, the Finance Council was instrumental in providing the funds we needed to pay for organ lessons, and the Cathedral organist agreed to work with our young and gifted pianist. Step 8: Invest in your people. Pay good cantors. Hire section leaders. Pay for workshops and education like the CMAA Colloquium and/or lessons for a singer or an organist. The money saved from not being vested in the Big Three church music conglomerates can go a long way when spread about the village. Since we are on the topic of education, I’ll mention here that it was and continues to be a big component of our sacred music program. Whether through the bulletin, a homily, classes, handouts, or our website, olmjasper.com, we sought first to prepare good fertile soil into which we would be sowing seed. All of this takes time and careful planning. Read that again: Time and Planning. When we would introduce the Missa de Angelis was as important as how and why. Why we sing an Entrance Antiphon instead of a “Gathering Song” was as important as how we did it. We prepared for months in advance of the new missal. At times, our bulletin was so packed with inserts that it more resembled a magazine than a pamphlet. Fr. Byrd developed a website with formation and education as its primary goals. Yes, the Mass time and directions to the parish are there, but so are articles expounding upon various saints or hymns or any number of topics that make for a better formed Catholic. Music training sound files are placed on the website so that folks can listen and learn the various chants at home. This takes time and a great deal of coordination and cooperation in the village, but the payoff is a firm foundation. And by the way, we copyright nothing, so feel free to copy and adapt anything on our website for use in your parishes. Step 9: Education and formation are critical. Predispose and prepare people for changes. This takes time. Step 10: Create a Catholic ethos. This may seem simplistic or perhaps vague, but I can’t express the importance of creating an environment where the truth and beauty of our Faith is evident in every nook and cranny of parish life. I began this article by describing the simple exterior of a small village church, but I would be remiss if I didn’t mention the nobility one encounters upon entering. Everywhere one can see signs of great devotion to Our Lord, Jesus Christ, and to his mother, Our Lady of the Mountains. Worshippers here are surrounded by saints and angels represented by works of art in paint, glass, wood, and stone. In the chancel where the choir sings are newly commissioned icons of St. Gregory, St. Ambrose, St. Cecelia, and St. Hildegard — their watchful gaze will bless various ensembles who have taken these saints as their patrons. In the not-too-distant future, magnificent stained glass windows honoring King David, the psalmist, and King Josiah, the great reformer, will look kindly onto the musicians who sing and play beneath their stoic visages. The Liturgical rites are carried out with great dignity and solemnity, and those that have the responsibility of singing the rites are aware that their work is holy insofar as it is connected intimately to the liturgy. Sacred Music does not exist in a vacuum. It has no life of its own apart from the lex orandi and lex credendi of Holy Mother Church. And finally: THERE WILL BE BLOOD. This is not a step towards creating a sacred music program in your parish. This is a reality. Not everyone will want to be part of the village. In fact, there will be those who would rather see the village burn than go along with any changes that aren’t in conformity with their way of doing things. There will be angry emails and copies of On Eagles’ Wings anonymously left under your office door. There will be outright rebellion by some, and when sensing that they aren’t going to get their way, there will be those who will leave the parish. You will explain over and over that Latin was not banned by Vatican II, and that learning a Latin Mass setting isn’t as bad as all that. There will be letters written to the Chancery with any number of grievances spelled out in vivid detail: The chant! The incense! The Latin! The horror! But you will find, as we did, that the Diocese will back you up. (Thank you, Archdiocese of Atlanta!) It could get ugly, so begin praying for your parishioners and don’t stop! Slowly, slowly, the naysayers will either be gone or be quiet, and you will find your parish filling up with people in search of something that is missing in that parish in the big city or the town next door. And there will be peace…mostly. In closing I would add that when we are obedient to God in the moral and spiritual life, things can become clearer. Our world may remain confused, but at the same time, we are less confused about right and wrong, and understand why things are the way they are. This does not mean that we are always perfect, but at least we can recognize our own mistakes. The same may be said of the liturgy. When we endeavor to live out the liturgical vision of the Church, we learn things. We learn that one doesn’t need banks of speakers and bongo drums to worship like Catholics. Neither must we have a choir full of Julliard graduates who may or may not believe in God. Bigger is not always better. Trust us when we say that authentic Catholic worship (as it is envisioned by the official liturgical documents of the Church) really is ideal for any sized choir or congregation, and when you get people singing antiphons and hearing and singing more and more sacred scripture throughout the Mass, it is a good thing! By living out the Church’s vision of the liturgy, our vision becomes clearer. Simply put, we are not entertainers. Instead, we are called to fulfill a time-honored role within the liturgical life of the Church, by intoning and chanting specific texts given to us by the saints of old. That is the vocation of the chorister: to allow the Spirit to teach us to pray, so that the Body of Christ can offer up fitting and worthy praise to the Father. We’re not making this up. It really is that clear. And we’re trying to be obedient to that vision. Thus, we believe our choirs can grow in holiness, and likewise, others around us. And if what we have learned here in our little parish can help others, then praise God.